Football is a man's game. The only times that women should feature in the world of the beautiful game is either when they're at the side of their player boyfriends or else when they're watching a game. And, in the case of the latter, they probably only do this to check out players' bodies rather than for any real passion for the game. After all, it is well known that women don't understand the offside rule and cheer at all the wrong moments. While such views might seem extremely chauvinistic, the truth is that they are also surprisingly widespread. Take FIFA president Sepp Blatter who, a couple of years back, famously claimed that women playing football should wear tighter outfits to make the game more interesting. Despite such condescending views, however, the popularity of the women's game is on the increase. A professional league has just been re-established in America whilst the likes of England and France are closing the gap with the traditional European powerhouses of Norway and Germany thanks to a huge surge in participation. In Malta it is a similar story with a league that has been thriving for the past decade and a national team that is getting better with each game. Yet the real signs of progress lie in the number of girls' teams that are popping up all over with the nurseries that previously used to cater exclusively for boys now starting to open up. That these girls will now have access to coaching from an early age should be the key to future success. It is a completely different situation to when Maria Coppola was starting out some twenty years back. 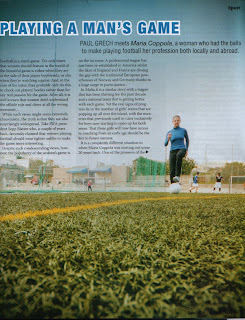 One of the pioneers of the women’s game in Malta, by playing at a professional level abroad she has achieved the sort of success that most of her male counterparts don’t even dream of. In hindsight, that could have been the making of her. Whilst there’s a lot to be said for today’s structured coaching systems, nothing beats the lessons one learns playing such ad-hoc games: they provide the ideal platform to practice until you perfect your skills. And, in Maria’s case, they exposed her to the more physical nature of the game which might not have been the case had she been playing with other girls. The opportunity to do so quickly presented itself. A talent scout spotted her playing and liked what he saw. He put forward the possibility of a sports scholarship in America and she promptly accepted. Not yet out of her teens, she was about to move to the other side of the world to follow her dream. If the American experience was a great life lesson, it was just as successful on the playing front. Eventually, she returned to Malta where the women’s league was kicking off and played for a number of teams including Lija, Melita, Rabat and Hamrun. She even had a brief taste of national team football before setting off for another experience abroad. Even so, her illness meant an abrupt end to her playing career. This, however, didn’t diminish her love of the game and, as had happened a decade earlier, another chance encounter meant that new opportunities opened up.